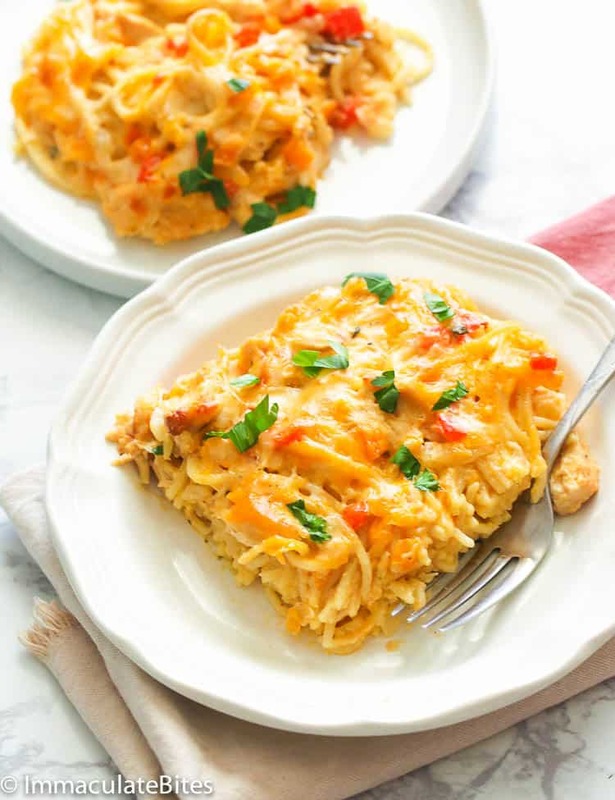 Chicken Spaghetti Recipe – a flavor-packed cheesy, gooey and filling casserole dish with all the best things you’ll ever want in a food: cheese, chicken and pasta. The ULTIMATE comfort food! I may have used that word “ultimate” quite a few times here on the blog, but trust me, this chicken spaghetti recipe truly deserves that label across its face. Gooey, cheesy, tasty and filling – I mean what could you ask for more? The moment this casserole was set on our dining table last weekend, everybody else were digging in even if it’s piping hot. Just the sigh of it in front of you will make your stomach growl, and the taste…oh forget the calories…this is a new favorite here at home. My boys were noshing it down scoop after scoop. It’s the perfect weekend dinner to share with your family. Casserole dishes are always a hit year-round here at home. And I do love preparing them as they can be prepared ahead and some of them are simply the dump-and-bake style. But my go-to would be this Ground Beef Casserole and Chicken Broccoli Rice Casserole for a family weekend dinner or when friends are coming over. This Chicken Spaghetti recipe tho is on another level. 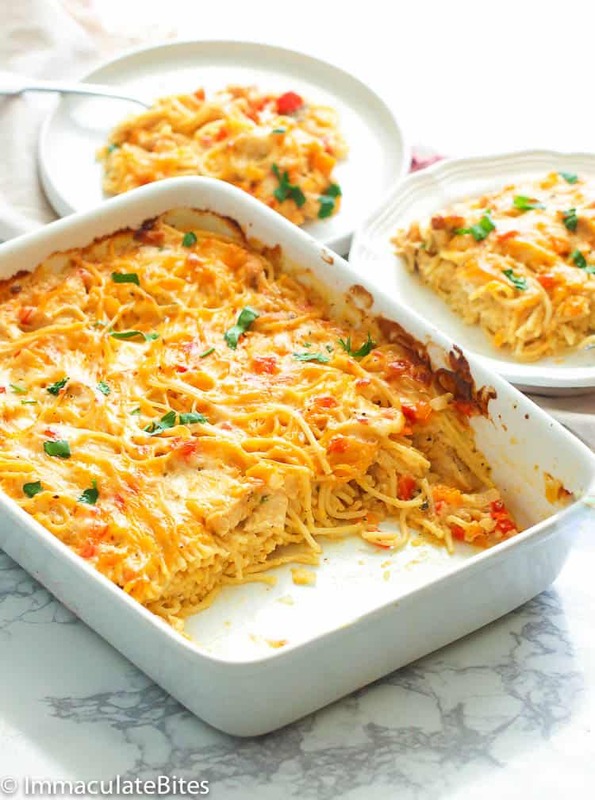 It has cheeses (three kinds of cheeses to be exact), shredded chicken and spaghetti cooked in a silky smooth flavorful cheesy sauce before its even baked. There maybe a lot going on in this dish, but every piece of it are diced to meld beautifully without overpowering the other. 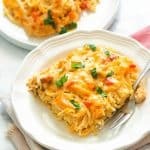 How do you make chicken spaghetti? Let’s start off with the chicken. For this recipe, I use a leaner white meat chicken breast as it is the only available cut in my freezer. But you can switch it up with your favorite cut and dice them or shred them up carefully. Make sure to use the boneless ones. Or if you have leftover rotisserie chicken, that works great, too. Moving on, you may want to pay a closer attention with the sauce as it is the make-or-break point for this recipe. Every strand of your spaghetti should be coated well with this smooth and flavorful sauce before popping it in the oven. You don’t want to mess this part! The sauce is quite jam packed with flavors from onion, garlic, thyme and Creole seasoning. If you don’t have Creole seasoning readily available, feel free to substitute it with cayenne pepper and/or paprika or the popular Old Bay seasoning as it is relatively close to that of Creole seasoning. To achieve a smooth, creamy-textured sauce, I gradually added evaporated milk to melt the flour while stirring consistently before I even added the cheeses. Don’t forget to reserve some for the toppings. Let the cheeses melt all throughout before you add the spaghetti into the skillet. Coat it and coat it well to make sure every strand is hug with the white cheesy sauce. Transfer it to the baking dish and top it with the remaining cheese (you can go for more if you want to 😉 ) before you pop it in the oven. If you want a little crumbly crunch on top of this baked chicken spaghetti, you can add some butter-sauteed breadcrumbs, see my NOTES part in this popular Baked Mac and Cheese recipe. Now serve them piping hot and watch it vanish before your eyes. I doubt if there’ll be any leftover. You can serve this on regular weeknights or on special days any time of the year. 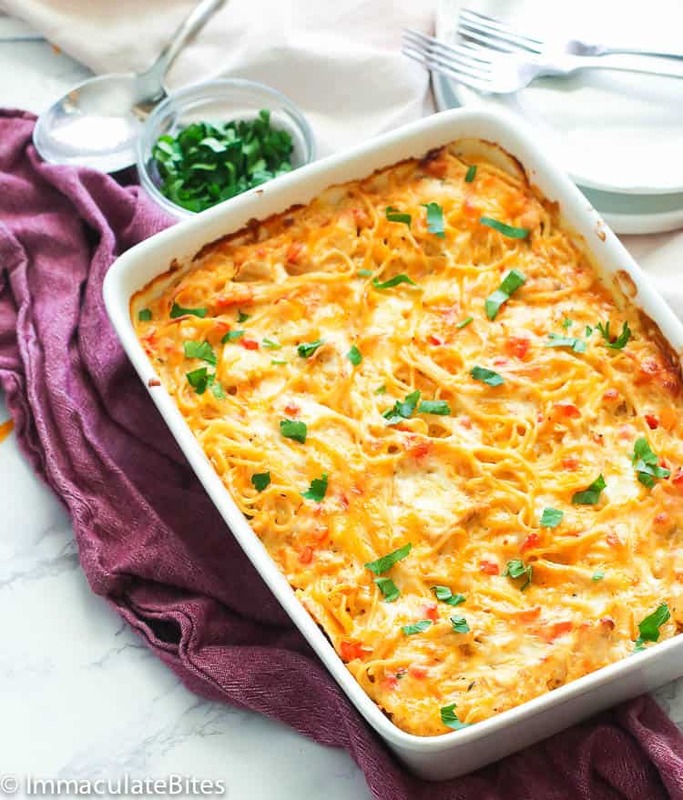 It’s a great addition to your list of deliciously cheesy comfort food! You may use your favorite boneless chicken cut and either diced or shred them up after cooking. Leftover rotisserie chicken works great, too. 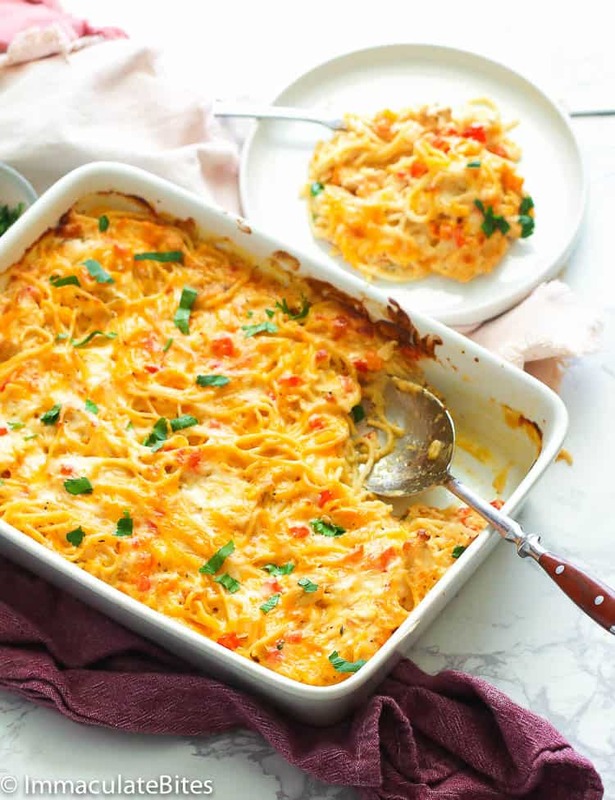 Chicken Spaghetti Recipe - a flavor-packed cheesy, gooey and filling casserole dish with all the best things you'll ever want in a food: cheese, chicken and pasta. The ULTIMATE comfort food! Start by boiling spaghetti in a large pot, according to box instructions. Drain and set aside. Season chicken with salt and pepper or use your favorite spice mix. Let it sit until ready to use. Heat up a dutch oven or medium pot over medium high heat . Add about 1 tablespoon oil to the skillet. Then add chicken, saute chicken for about 5-6 minutes on each side until chicken is cooked through. Remove and set aside. Heat butter or oil in a skillet or pot over medium heat. Then add onions,garlic, thyme and Creole seasoning. Cook and stir for about about 3-4 minutes, until onions has wilted. Throw in tomatoes, bell pepper and continue cooking for about 2-3 minutes. Stir in flour until flour has been fully incorporated, stirring for about a minute . Gradually stir in evaporated milk and broth. Bring to a boil, stirring constantly; about 2 minutes or until thickened and bubbles. Stir in the cheeses, and continue stirring until everything’s melted and evenly combined and smooth. Salt & pepper to taste. Then add the spaghetti and chicken to the skillet, stir to evenly incorporate. Transfer the spaghetti mixture into a pan or into a lightly greased 2-qt. baking dish; top with remaining cheese. Bake at 350 Degrees F° for 20 minutes or until golden and bubbly. Preheat the oven to 350 degrees. Start by boiling spaghetti in a large pot, according to box instructions. Drain and set aside. Season chicken with salt and pepper or use your favorite spice mix. Let it sit until ready to use. Heat up a dutch oven or medium pot over medium high heat. Add about 1 tablespoon oil to the pot. Then add chicken, saute chicken for about 5-6 minutes on each side until chicken is cooked through. Remove and set aside. Heat butter or oil in a skillet or pot over medium heat. Then add onions,garlic, thyme and creole seasoning. Cook and stir for about about 3-4 minutes, until onions has wilted. Throw in tomatoes, bell pepper and continue cooking for about 2-3 minutes. Stir in flour until flour has been fully incorporated , stirring for about a minute. Gradually stir in evaporated milk and broth. Bring to a boil, stirring constantly; about 2 minutes or until thickened and bubbles. Transfer the spaghetti mixture into the pan or into a lightly greased 2-qt. baking dish; top with remaining cheese. Bake at 350 Degrees F° for 20 minutes or until golden and bubbly. Is it 1/2 cup chicken broth or 1 1/2 cup? Its 1 and 1/2 cup chicken broth. You have preheat oven at 350 but then cook at 375. Is this correct? When do you put in the chicken? After the spaghetti? It’s been updated . Bake at 350 degrees. You add the chicken together with spaghetti. Thanks for bringing this to my attention. Really excellent! Great mix of flavors and textures. I would suggest making it in a larger casserole dish rather than the 2 quart you suggested. I thought it looked like it needed a bigger dish so used a 3 quart and it still came up to the top of the dish! We have lots of yummy leftovers! My husband just announced it was his favorite meal in a long time! Thanks for sharing, Carole, and for taking the the time to let me know. Happy New Year to you an your family! I made this for Sunday lunch, awesome delicious ,moist, tasty . My family totally loved it. So excited to make this this weekend! I find that at my grocery store I have a hard time finding pure Monterrey jack. They do have a mix of mild cheddar and Monterrey jack, do you think that would work okay? P.S. 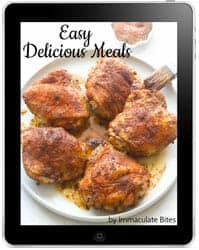 I have made SO many of your recipes and they are all a hit, my favorite are the oxtails and the jerk chicken. So sorry, I somehow missed this . It would do be just fine . So happy to hear the recipes are working out well for you. This dish looks really good. I will be making it except that I will be omitting the chicken. I’m vegetarian. You can also do that, Esther. Thanks for dropping by. Hello, first of all I just discovered this site last night and I am in love with it already!! I am planning on making the 1 skillet Jerk Chicken & Rice & Peas (using Gunjo Peas instead of Red Kidney) dish tomorrow since my 13 year old will be gone with his cousins to DC. I am thinking about making this meal tonight. I just want to clarify something though. I plan to use a cooked rotisserie chicken (because I already placed the whole chicken in my rotisserie this morning) I should skip step 5 entirely correct, as my chicken will already be cooked. I think this looks absolutely divine and you cant go wrong with cheese, lol!!! So happy to have you on board . Yes it is correct you can start cooking from step 6. Do let me know how it works for you.Thanks! Thank you Imma!! I am going to go ahead and run to the grocery store to grab some more cheese and a yellow pepper. I will report back after dinner and le you know how it turns out!! Thank you sooooo much, this was a complete hit with both the 14 year old and the 51 year old!!!! The young man asked if I could warm it up and put it in a thermos to stay hot so he could take it with him on his field trip tomorrow to DC (they have to bring their own lunch)He was disappointed when I said no because I had already packed his requested lunch and then made my husband swear he wouldn’t eat the rest because he was planning to eat it when he gets back from his field trip, lol!! The only adjustment I made to this was instead of 3/4 cups of parm I used a 1/4 cup mixed with the bread crumbs for the topping (I use this on chicken & turkey tetrazzini) and I added 1/2 Fontina cheese in the spaghetti. I will be adding this to the monthly rotation. Also I feel like this would freeze very nicely for meal to pull out to thaw night before and pop in he oven next day!! I cant wait to make this One Pot Jerk & Rice tomorrow!! Thanks again for sharing!! !